Cleaning or stripping is the removal of undesirable substances, thin films or residues from a surface. The ability to perform delicate cleaning without damage to the underlying part is a critical benefit of MicroBlasting. The selective cleaning process uses the abrasive qualities of MicroBlasting to carefully erode layers of unwanted material from a base substrate. The process takes advantage of the different physical properties of the two layers. Brittle materials can be removed from soft ductile layers, or soft ductile layers can be removed from brittle layers. The difference between selective cleaning and controlled erosion is that controlled erosion is performed on a single material type or layers of material with the same properties. Two blasting variables to consider before removing a soft ductile material from a brittle base substrate. Abrasive Selection: A dense abrasive, like aluminum oxide or glass bead, transfers energy into the brittle layer, fracturing it. 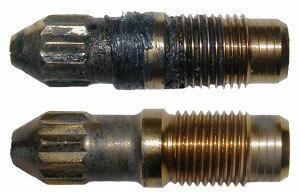 When it strikes the ductile layer, a broad area absorbs and then releases the energy of the striking abrasive. The elastic nature of the substrate keeps it from eroding. Particle Velocity: The soft ductile substrate could be burned if too much energy is transferred to the target. Gradually increasing pressure speeds up the removal process, but high particle velocities may cause damage to the substrate. Considerations before removing a brittle material from a soft ductile substrate. 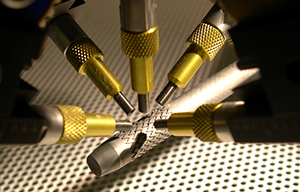 *MicroBlasting works well when the brittle layer has strong cohesive forces and weak adhesion properties. MicroBlasting provides the flexibility most selective cleaning applications need. A manual system is ideal for lower volume applications. High variation in part geometry or blast location benefits from the skilled eye of an operator using a manual system to selectively target surfaces on parts. For instance, excess epoxy can unevenly distribute on probe rings, and fossils come in all shapes and sizes—from trilobites to T-Rexes. Some applications may be good candidates for automation but lack volume in their early stages. 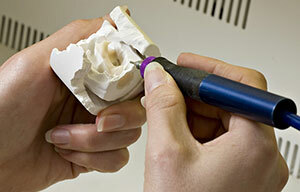 For example, during the prototyping phase of a new pacemaker, the design is optimized in low volume. 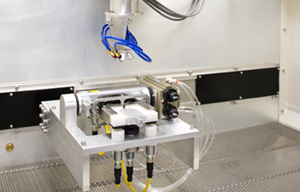 Once this technology moves into production, MicroBlasting can transition seamlessly from a manual system to an automated system, primarily because the core blaster stays the same. Automation just provides parts handling and control over the process. This means that the whole selective cleaning process does not need to be re-qualified, it simply needs to be expanded. the delineation from coated to uncoated must be sharp. the coating must be completely removed. the integrity of the wire must be maintained. Sodium bicarbonate is an ideal abrasive media for this application because of its physical properties and water solubility. 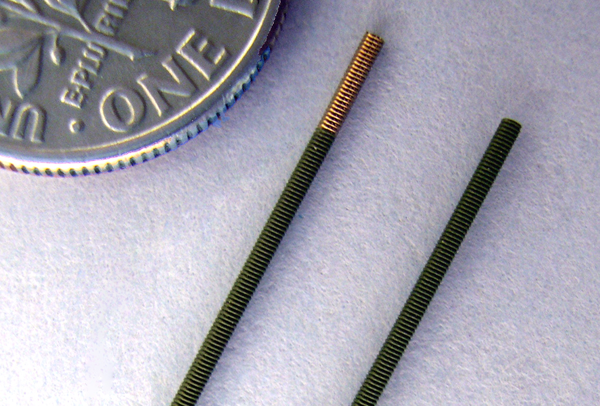 The particles are sharp enough to cut through the PTFE’s long fibrous strands but soft enough to leave the guidewire unharmed. Sodium bicarbonate is listed as a 3 or 3.5 on Mohs. It is ideal for interventional use because it leaves no residue following a standard cleaning process. Removing the calcium and rock layers that surround a fossil is challenging and tedious. This matrix can be closely bonded to the fossil itself. While a pneumatic hammer may be used to make the initial “rough” cut, a skilled operator must remove the remaining matrix. 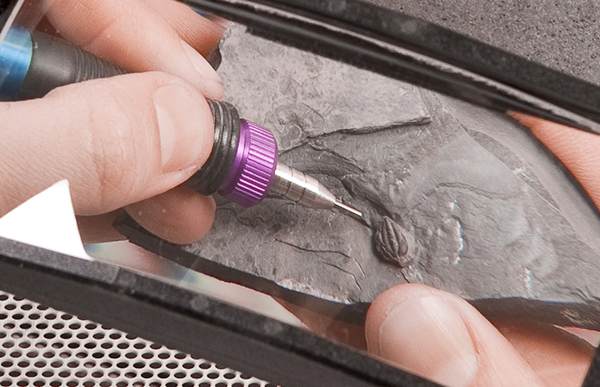 The highest potential for damage to a fossil happens during the removal of the final layer. MicroBlasting’s accuracy and control combined with the right abrasive reduces risk to priceless artifacts during this critical operation. Common abrasives for matrix removal are sodium bicarbonate and pumice. 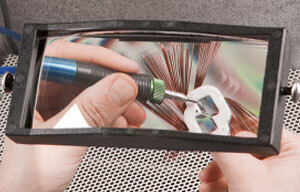 Both abrasives chip away at a brittle matrix without damaging the delicate fossil underneath. 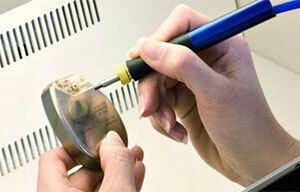 The process should be done in a customized WorkStation equipped with a magnifier to enhance control and precision. Traditional processes for conformal coating removal from printed circuit boards involve either scraping, using chemicals or using extreme heat—all of which have significant drawbacks. 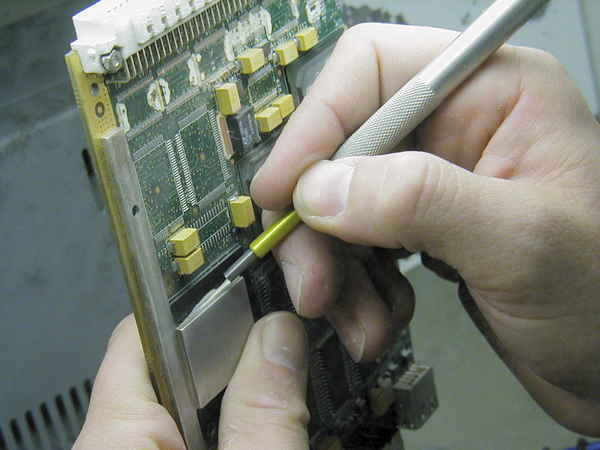 MicroBlasting provides a precise, safe and cost-effective method for removing conformal coating, whether the application requires very inconsistent and selective removal for component testing or replacing, or the application involves high-value boards. Blasting parameters can be configured to differentiate between the coating and the board and set to provide consistent results board-to-board. A wide selection of abrasives is available to suit most types of coating. 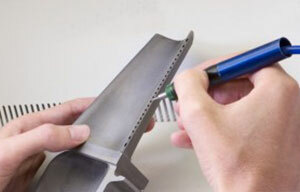 Our Application Profile page for conformal coating removal provides a comprehensive look at this case study, including a quick guide to abrasive selection. Removing Conformal Coating? Consider Wheat Starch.